of Translator jobs in Himachal Pradesh State. Candidates who are having good knowledge in Urdu language will be preferred for this Translator jobs in Himachal Pradesh Translator Jobs. Candidates will be selected based written exam for this Translator jobs in HC HP. 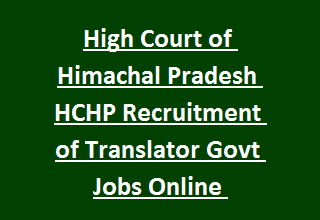 Last date for submission of application for this Translator jobs in Himachal Pradesh High Court is 24-11-2017 by 11:45 pm. Last date to reach online application form acknowledgement and Fee E receipt to High Court of HP is 30-11-2017. Candidate will receive Admit Card details and exam date to registered mobile only. There is only 2 Translator posts in this HP High Court jobs. Candidate must have qualified degree along Hindi and English Subjects with at least 50% of marks. Those candidates who are having knowledge of Urdu language will be considered for selection. Age limits are applicable as per the Himachal Pradesh State govt norms. Based on candidates degree marks percentage and languages knowledge candidates will receive written test or admit card information. Those who are shortlisted they only receive the SMS alert.